Many cultivars of flowering dogwood (Cornus florida) are bred to dwarf size, but cultural practices are the same for small and large dogwoods. The world's fascination with this graceful, spring-to-summer blooming tree has even led to weeping ornamental varieties. Where blooms were once a standard pink or white, now there are endless variations in red, scarlet and purple. The University of Tennessee recommends planting dwarf dogwood in light shade and moist, well-drained soil for optimum growth. Dwarf dogwoods can also be grown in full sun, provided that the ground is not chronically dry. Choose a location for planting dwarf dogwood where it will get plenty of dappled light. Because dogwood occurs naturally as an understory plant in woodland environments, it benefits from the shelter of other trees. A backdrop of hemlock or white pine will let plenty of light through, while giving dogwoods protection from strong winds and harsh weather. 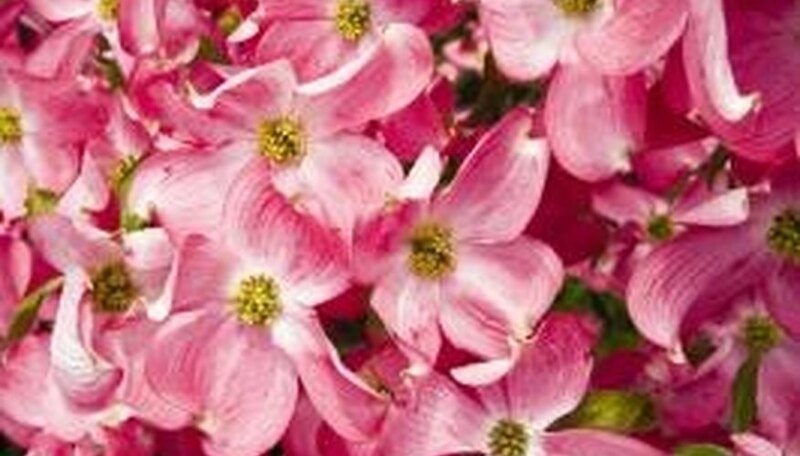 Plant dwarf dogwood in moist, rich soil, and make sure you don't plant too deeply. The root crown (where the trunk meets the soil) should be 1 to 2 inches above the soil line at planting to allow for settling. Think again of the forest floor where dogwoods naturally grow. It is mulched by dead leaves, which insulate while putting nutrients back into the soil. Use mulches that are composted or organic, such as composted grass clippings, pine needles and wood chips. Spread mulch in a 3-foot ring, 2 to 3 inches deep, six inches from the trunk of dwarf dogwoods. Don't let mulch contact the trunk, or it will cause rot. Rake out mulch annually, and replace it to provide continuous soil temperature regulation and weed suppression. If you mulch correctly, you will not need to fertilize dwarf dogwoods at all. Once established, dwarf dogwoods need little to no pruning to remain healthy. Prune away dead or storm damaged branches, taking whole branches back to the trunk rather than clipping branch ends. Set the shear blades at a 45-degree angle, and cut down and away from the trunk, leaving a half-inch stub that will drain moisture instead of collecting it and causing rot. Pruning can be done at any time of year, but late fall to early spring is best because insects and fungus are less active and less likely to infect pruning wounds.